I figured I'd address here one question I get often at the festivals: "How do you power your lights? ", or "What is that solar panel on your tent?". First, why I have this at all, as it adds a few pounds and a bit more complexity to my booth setup: about half of what I sell are light fixtures that require an outlet to work, and I totally understand that some customers would be skeptical of buying something electrical for $60+ without seeing it work first. Plus it just makes everything look much cooler: the Edison bulbs are works of art themselves, and the LED & cut glass lighting just ain't that exciting if its not powered up. So I need a power source, and almost all of the festivals enumerate in their rules that 1) they don't provide power, and 2) generators are not allowed. That leaves you with a battery. I used to have a UPS (uninterruptible power supply) for my computer, and initially looked at those. But those are not really designed for full drain / charge cycles, more to level out brief sags or power outages. 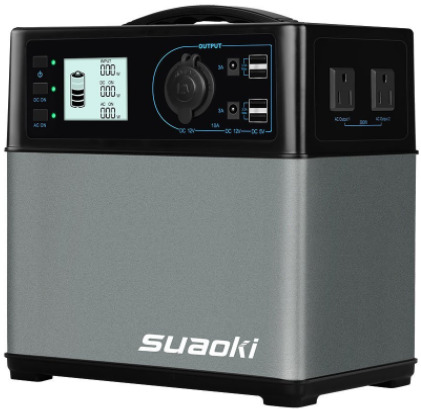 In my searching, I stumbled across a few batteries that would work, and bought the least expensive 400Wh well-rated device, the PowerOak / Suaoki device. And to make sure it has enough juice to run through the full day, I am also continuously recharging it with a matching 100w solar panel. If you're looking at doing something like this for yourself, make sure you get enough power! For some electrical basics, a Wh - pronounced as "watt-hour" - is the number of watts a device uses multiplied by the time it is one. So a 40w bulb on for one hour would use 40 Wh. I have dimmers on all my lamps, but they still need to be bright enough to be seen in the daytime bright sun. So the bulbs use about 25-30w. And I want to have 3 or 4 fixtures on to grab attention - so that's 75-100w. The 400Wh rating is the rating of the battery, and batteries produce DC power. So it needs to be converted to AC power before the lamp can be plugged in. There is power lost in that conversion, so it's probably only about 350Wh AC. That would power my booth for about 4 hours. 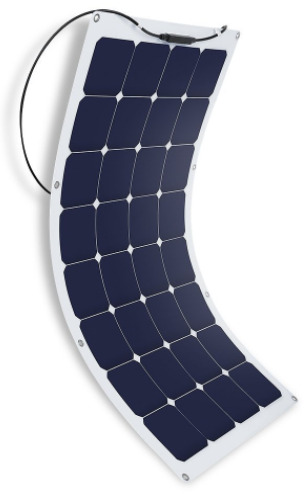 The solar panel, in "peak sun" (a bright cloudless cool day with the panel mounted directly facing the sun) will produce 100w. In practice, it ranges from about 10w to 70w - there's clouds and other shade; the day is warmer, and its a fixed panel, not always facing the sun. So it probably averages 35w over the day. So that offsets the 75-100w to be 40-65w on average. Now I can get closer to a full day at the festival with one battery, as 350Wh / ~50W = 7 hours. 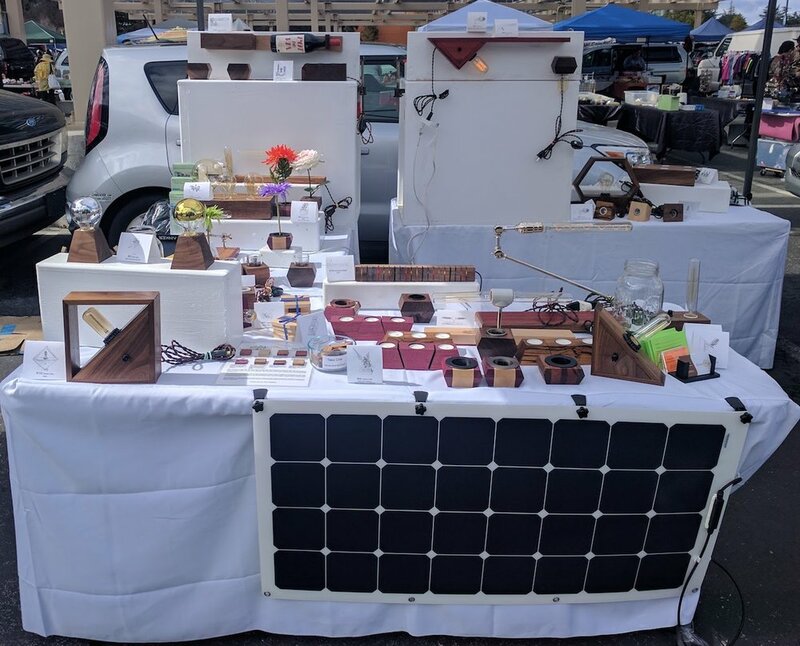 I initially started with the panel mounted to the front table of the booth, but this had two main problems: too much shade / not facing the sun, and too much conversation, attracting questions from folks who had no interest in my booth but for the solar panel. Maybe I'll revert to this setup when I table in promotion of my sister business, Branching Out Solar? [2019 update: I closed Branching Out Solar shuttered in late 2018]. But in the meantime, I needed to attach the panel to the top of the tent without putting holes in the water-proof canopy. 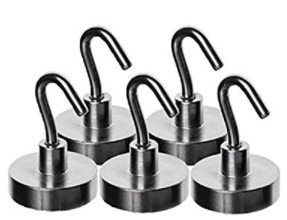 So I picked up a set of these nifty magnetic hooks, and used rare-earth magnets on the other side. Problem solved.